As I mentioned in my last post Bluebird is the best and easiest way to get into manufactured spending. Why is it the best? Well for many reasons: first, it offers the ability to load via Vanilla Reload Cards. This is great, because you can buy these at CVS Drugstores with a credit card! Second, there are virtually no fees, which makes your points and miles profit margins much larger. Finally, it’s run by American Express and Walmart who have been very lenient with manufactured spending. So, you have a much lower chance of having your Bluebird account closed by manufactured spending than you do with another prepaid company such as Netspend. As I have said multiple times, manufacturing with Bluebird is the best and easiest way to get into the game. I keep repeating this, because it simply is and it is well loved in the MS world. First and foremost, you need to get a Bluebird card. You can do that here. After that, you need to visit as many local stores as possible to find Vanilla Reloads that can be bought with a credit card. This is very much a trial and error step. You will be denied MULTIPLE times, because most stores only accept cash for the VRCs. CVS has the best track record for accepting credit cards for VRCs, but they sell out at CVS fast, so you need to try other stores. Also, if you spend $1,000+ (2 – $500 VRCs) on VRCs in one transaction CVS will scan your ID, because CVS only allows you to buy $5,000 worth of VRCs a day. This is not an issue, but if you would prefer they didn’t scan your ID, then buy 2- $495 cards per transaction. Once you have found the VRCs and have been able to purchase them with a credit card you need to load them to Bluebird. You can do that here. I will have a tutorial on loading your Bluebird at a later date. *Remember there is a $1,000 limit that can be loaded to your Bluebird, daily, as well as a $5,000 limit monthly. After you have the VRCs loaded and you are showing a balance, you will want to liquidate that money so you can pay your credit card bills. There are a few ways to do this, so you can pick your poison. Bill pay is my favorite way of liquidating money in Bluebird for many reasons. First of all, it is completely free. Second, it’s very easy. All you have to do is click Bill Pay when you are logged into your account, add your payee, which could be a mortgage, credit card, student loan, or whatever else you need to pay, add your account info and pay it! If Bluebird has your payee on file they will transfer it via ACH which only takes 1-2 business days. If they do not have your payee on file, they will send them a check which takes about 5-10 business days. This is my favorite liquidation method, because then I simply buy the VRCs with my credit card, load them on to Bluebird, and pay them off with Bluebird. That way you are basically spending the credit card’s money to pay off that credit card, it’s spectacular! Buy a money order with your Bluebird which will cost around $0.70-$1.30 per $1,000 money order, so this is not the best option since you will be spending more money to liquidate it. You could withdraw $2,000 to your bank account per month, which would put a dent in some of your Bluebird account. You could use Bluebird for your normal spending that you cannot use a credit card for such as shopping at Aldi or paying tuition. You could withdraw $2,000 from an ATM per month which would end up costing you $8 if you did not have direct deposit. You could write a Bluebird check (or two) to a friend and have them cash it out and give you the money. *As a side note, Bluebird checks are free to order until 4/1/14. I would suggest ordering them now, even if you don’t use them. Go to My Account > Order Checks when you are logged into your account. This is a big one for beginners! 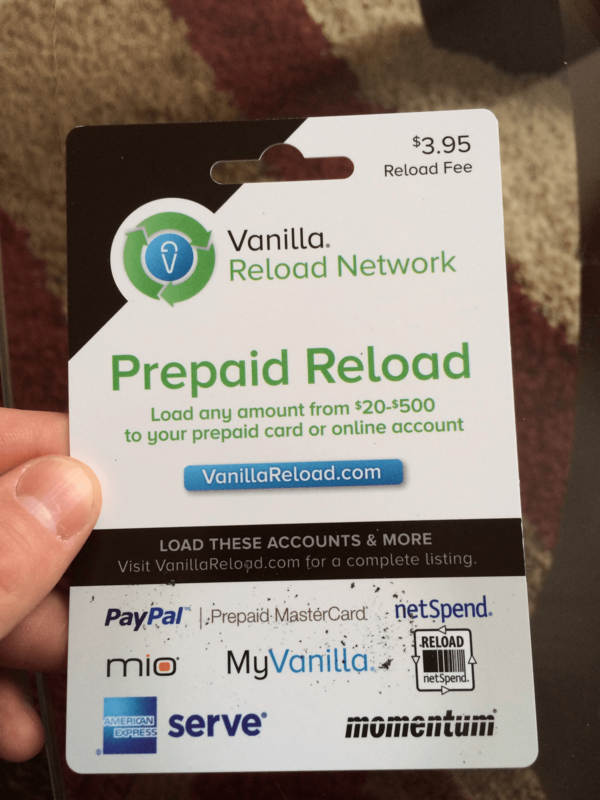 Make sure you are buying Vanilla Reloads and not another form of Vanilla. There are a few different types of Vanillas, so do make sure you reference the picture above to make sure you buy the correct Vanilla. There are other ways to liquidate the other types of Vanillas that I will cover in another post. This is not a Vanilla Reload Card. This is a MyVanilla Card. You do not want this. Start small. Don’t immediately buy $5,000 worth of VRCs. Do some research, go to as many local stores as you can to try and find VRCs. Spread out your spending and use multiple credit cards You do not want to be spending $10,000+ at CVS on one credit card or the credit card issuer may get suspicious and possibly close your account. Don’t be disappointed if you get turned down when you try to buy Vanilla Reload Cards with a credit card. This happens A LOT. Make sure to Stay Organized! Organization is key, you do not want to miss a credit card payment or the interest you will/penalty fee will negate the rewards you are earning. The most important thing though, is to have fun. This can be a very profitable and fun hobby, so enjoy it.